CONFIRM YOUR 2019 TOUR PLACE – BOOK NOW! Our 14 day, 765km epic will take you all the way from the southern tip in Kenting – via Taiwan’s mountainous heart – all the way up the stunning east coast back to Taipei in the very north of the island. Highlights include a huge 3000m descent from Lishan in the precipitous Central Mountain Range to Jiaoxi at sea-level, as well as the world’s longest and most spectacular climb along the route of the Taiwan KOM in Taroko Gorge. Some stunning coastal roads, mellow cruising through rice paddies and of course loads of fantastic Taiwanese food round off the experience! Average riding per day is 80km and 1000m climbing. Fancy a real challenge? This 4 Day tour more than delivers as you’ll take on the longest road climb in the world – the Taiwan KOM. 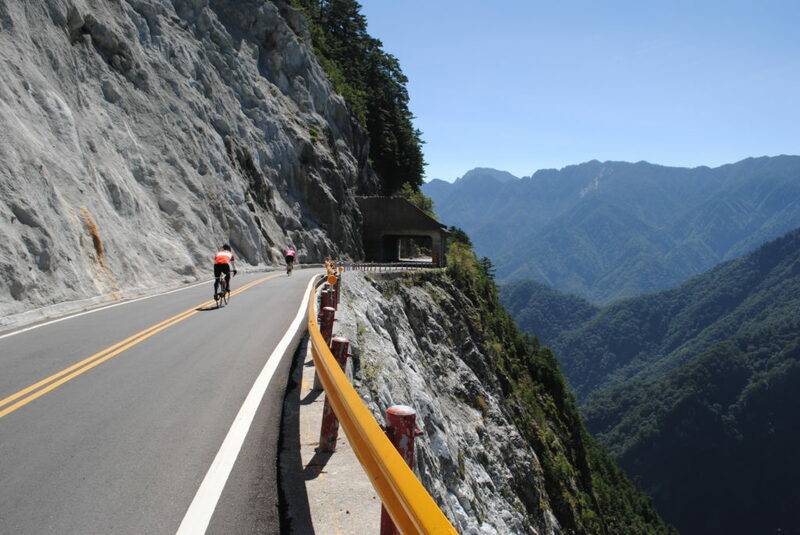 From sea level, you’ll ride up the incredible Taroko Gorge to the highest road in Taiwan, Wuling Pass, at 3280m. The 4000m of climbing and over 80km in the saddle make this spectacular ride one of the most gruelling in the world. But what goes up must come down! So having completed the world-famous climb, the following day you’ll descend 170km down the beautiful Lanyang River valley, before rolling back into Taipei via a spectacular hidden route through lush forests on the final day. Average riding per day: 130km and 2000m climbing. Looking for a private or custom tour? We can offer amazing bespoke tours, tailored exactly to your needs! We’ll use our expert knowledge of Taiwan to get back to you with a custom quote designed just for you! OUR TOURS HAVE LIMITED SPACES SO DON’T MISS OUT – GET IN TOUCH AND BOOK TODAY! GET IN TOUCH - BOOK NOW!